Wilson Perumal & Company is pleased to announce the appointment of Hundley M. Elliotte as partner. Hundley brings a unique perspective to WP&C and will work closely with clients to help them align growth and operating strategies and reduce business complexity. This latest partner appointment bolsters the firm's dynamic growth, with the size of the leadership team having almost doubled in the past year. "Hundley brings remarkable depth of talent, experience, and perspective, and we have witnessed him add tremendous value to his past clients," says Andrei Perumal, co-founder and managing partner of Wilson Perumal & Company. "We have known Hundley for many years, back to our days together building the complexity and operations strategy practice at George Group Consulting. I personally have learned a great deal from him and could not be more thrilled to have him join our team at this point in our journey." Previously, Hundley was a partner at George Group Consulting and served as a senior partner in the Accenture Strategy practice. His consulting teams are regularly recognized for helping clients undertake monumental transformation and achieve outstanding performance, including having received the US Navy's Stanley Arthur Logistics Award for the development and implementation of a production ramp-up strategy to rapidly field 12,000 mine-resistant vehicles. Most recently, Hundley served as the interim CEO of a private equity-owned footwear brand. Hundley is a respected leader on the topic of operating strategy and co-author of Building High Performance Government: A Leader's Guide to Creating Speed, Agility, and Efficiency (McGraw-Hill). He has significant experience across diverse industries, including consumer goods, retail, consumer communications, energy, and building products, as well as in-depth expertise serving clients in private equity and federal agencies. 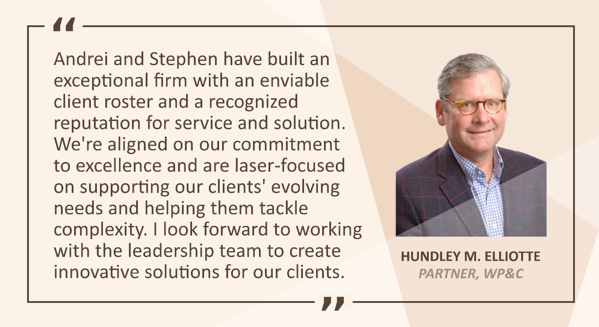 "We are excited that Hundley has joined the Wilson Perumal team in this next phase of our growth," said Stephen Wilson, co-founder and managing partner of Wilson Perumal & Company. "His broad experience driving transformation across public corporations, private equity-owned firms, and federal government organizations is a perfect match for our growth plans." Hundley is based in Atlanta and currently serves on the board of directors of the PE fund Tidewater & Associates and the University of Mississippi Business School.